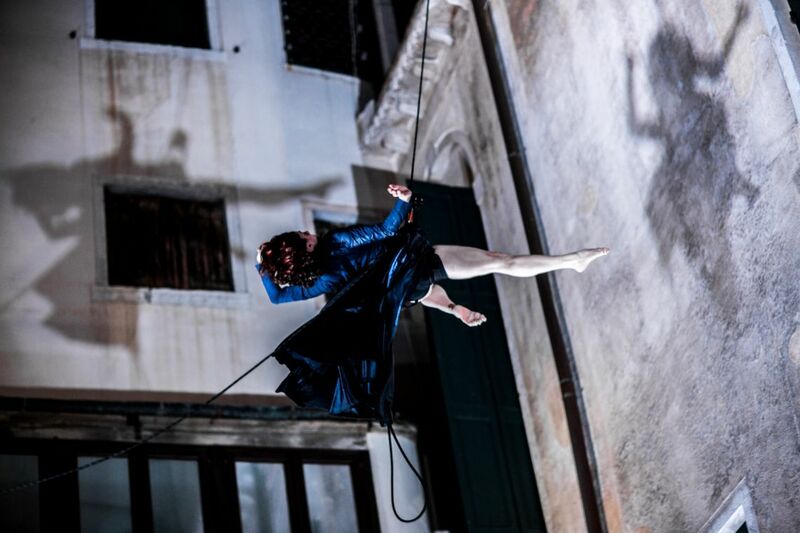 FAR VUOTO (2012), live performance on the facade of Palazzo Bembo. Wanda Moretti | Il Posto, FAR VUOTO (2012), live performance on the facade of Palazzo Bembo at the VENICE INTERNATIONAL PERFORMANCE ART WEEK 2012. Image © Monika Sobzcak. Il Posto, company under the direction of Venetian choreographer Wanda Moretti, works in the unique form of vertical performances on facades of architectural structures. Transforming through bodies and movement the spaces in which they perform, their work offers a transcendence of aesthetic vision with the scope of discovering new perspectives. A new, unexpected and uncommon point of view, a different visual perspective is presented to the audience, which becomes spectator of a change of setting, that shifts into different figures, visions and forms. Having worked among others at the Singapore Arts Festival, La Defense in Paris, Doha in Qatar, International Biennale des Theatres du Monde in Rabat in Morocco, Lugar Dança in Lisbon, Kaunas International Film Festival, Rome in Scena, Volterrateatro, Bolzano Danza and many others, Il Posto produced performances for the fronts of buildings, bridges, towers, lighthouses, monasteries, palaces as well as theaters, museums and industrial buildings. For the VENICE INTERNATIONAL PERFORMANCE ART WEEK 2012, Wanda Moretti | Il Posto feat. Marco Castelli present the new performance FAR VUOTO, conceived for the facade of Palazzo Bembo.